A Florida state agency said Friday it has opened a probe to find out why a roller coaster derailed at an amusement park in Daytona Beach on Thursday night. 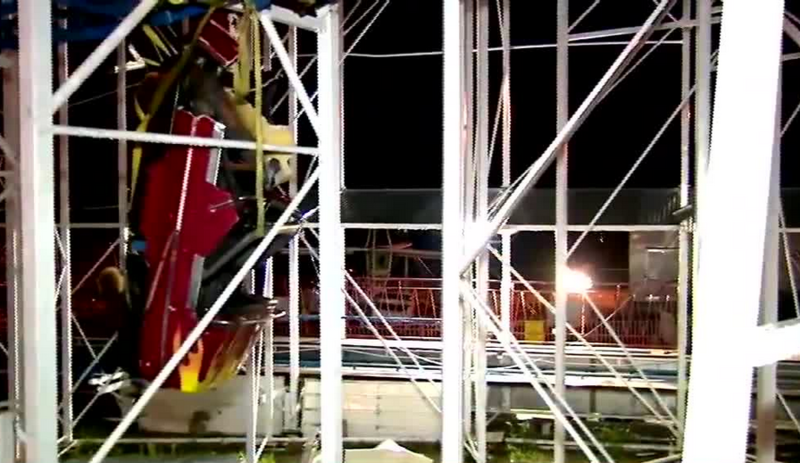 The terrifying accident sent two riders plunging 34 feet to the ground and left one of the ride's cars dangling with two other people inside, the Daytona Beach Fire Department said. They were among 10 people on the Sand Blaster ride at the Daytona Beach Boardwalk. Six people remained hospitalized Friday. "First and foremost, we're concerned about the individuals who were injured last night. Their well-being and recovery is of the utmost importance," said Jennifer Meale, spokeswoman for the state's Department of Agriculture and Consumer Services. "Just yesterday, department inspectors conducted a thorough inspection of the ride, and it was found in compliance with state law," she continued in a statement. "We have launched an investigation to determine the cause of the accident, and anyone who should be held accountable will be held accountable." After the accident occurred, responders raced to the scene, working speedily to keep the dangling car from falling. They plucked the two riders from it and brought them and the others on the ride to safety. "Firefighters had to get ladders on ground. We have a tech rescue team specializing in high rise rescues," fire department spokeswoman Sasha Staton told CNN on Friday. "They were the ones that successfully removed the two dangling riders to the ground." Those four riders -- all of whom were on the same car -- and two others were rushed to Halifax Hospital in Daytona Beach. A hospital official said information about their condition might be released later Friday. "It was definitely chaotic and time-sensitive," Staton said. "We didn't want the dangling car to fall any further." Police kept "many bystanders from all directions far enough away for their own safety because we had a lot of equipment and for the firefighters safety so they'd have plenty of room to work and evacuate the riders," Staton said. The Daytona Beach Fire Department posted images and videos on its Twitter account showing the scene at the dangling roller coaster car. One of the videos showed the stranded riders being rescued by ladder. According to The Daytona Beach News-Journal, the Sand Blaster has been at Daytona Beach since 2013 and that the "ride was 40 years old and was purchased from a closed amusement park in Delaware at the beginning of 2012." CNN has contacted the Daytona Beach Boardwalk and the ride's owner for comment. Michael D'Aquino, a US Department of Labor spokesman, said the Occupational Safety and Health Administration isn't investigating the incident since no employees were injured.